To maximize revenue generation, calculate exact staffing needs so customers can be properly served. The average store netted 4% pretax to sales last year. Most think they made only 4 cents out of every sales dollar. That's a dangerous misconception. The idea that a store netting 4% pretax to sales only made 4 cents out of every sales dollar gives rise to the erroneous notion that, “To double my profits I'd have to double my sales.” Since most dealers know intuitively that it is probably impossible to double their sales in the near term, they reach the logical conclusion that it is also impossible to double their profits. Consequently, many dealers become discouraged and fail to do much of anything to improve their profitability, and that's a shame, because all that most dealers need to do to double their profits is to increase sales somewhere between 10% and 15%. Or, if they couple an even smaller sales increase with better inventory management and careful pricing to maximize gross margins and some prudent expense control, it isn't hard to double, triple or even quadruple profits! You have two kinds of expenses known as fixed and variable. 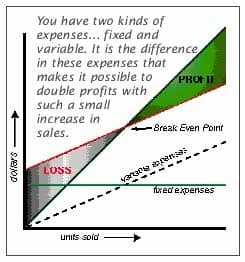 This is a very important basic concept to understand, because it's this difference in expenses that makes it possible to double profits with such a small increase in sales. Variable expenses are those expenses that vary directly with sales. As sales increase, so do these expenses. In a furniture store, variable expenses are typically advertising, selling and delivery expenses. Their total is usually somewhere in the neighborhood of 15% of sales. Since they vary directly with sales, variable expenses apply to every sale… the first one, the last one and every one in between. If your gross margin is 45%, your landed merchandise cost of sales is 55%. Adding 15% variable expenses to your 55% landed merchandise cost you arrive at what we'll refer to as a total cost of sales of 70%. This leaves 30% out of each sales dollar, referred to as contribution margin. It's called contribution margin because it is the portion that every sales dollar contributes to cover fixed expenses. Once your fixed expenses have been covered and you've passed your breakeven point, this 30% is contributed to profit. In other words, a store that nets 4% to sales doesn't make 4% out of every sales dollar. They don't make one thin dime; in fact they're in a loss position, until they've covered their fixed costs and passed their breakeven point. Once past their breakeven point they don't make 4% from every subsequent sales dollar, they make 30%! Knowing that, it's easy to see why it's so very important to plan your promotional activity to “pour on the coal” to maximize sales at the end of months when you've already passed your breakeven point. It is in these months, when business is good and your advertising is productive that you have the best chance to generate the bulk of your profits! Fixed expenses are those expenses that tend to be fixed in amount. We realize, of course, that all expenses are variable in the long run, but fixed expenses are either static over a range of sales volumes or they vary based on some other factor, such as inventory level. Examples of fixed expenses (also referred to as overhead expenses) would be things like administrative expenses, occupancy expenses (except for percentage rents which need to be included in your variable expenses), warehouse expenses, credit department expenses and “other” expenses, such as interest. How Do You Know What Your Breakeven Point Is? In other words, it takes $86,667 of sales at 30% contribution margin to cover the fixed expenses of $26,000. Incremental sales are the sales made after you've passed your breakeven point. Net Profit = Incremental Sales x Contribution Margin. Consequently, we can see that the last $13,333 of sales produces all the profit! All the rest of the sales went to pay the fixed expenses. The good news is that in this situation it will only take a sales increase of $13,333 to double the profit to $8,000! Maximizing gross margins through better inventory management and careful pricing can easily add another $4,000 to this store's bottom line. Better expense control might add yet another $4,000! In other words, it really isn't hard to double, triple or even quadruple your present profitability. The problem is that most retail store owners don't know where to start… what specific actions to take first that will produce the most rapid results. Many furniture dealers say, “We need to increase our profitability, we know that, but aside from poring over the list of expenses on our P&L Statement, which we've already done, we don't know what else to do.” If this statement summarizes your present thinking, you should consider looking at all your numbers… your Balance Sheet, your P & L Statement, your Sales Analysis by Category and Margin, your Sales Analysis by Vendor and Margin, your Inventory Markdown Aging Summary, as number of employees and square feet of show space. Complete analysis and identification of areas of strength and weakness require calculation of a number of financial ratios using numbers from all these sources and comparison of your ratios with those of the NHFA High Profit stores. Larry Stark is the Chairman of PROFITsystems, Inc. Larry spent the first 21 years of his working life running Stark's Furniture, the retail furniture business founded by his grandfather in 1897. He has spent the last 26 years running PROFITsystems, a leading retail furniture software and consulting firm located in Colorado Springs, Colorado. Inquiries on any aspect of retail financial management can be sent to Larry care of FURNITURE WORLD Magazine at lstark@furninfo.com.